The Chevrolet's 1.6-liter engine, named as the F16D3, is based on the 1.4-liter F14D3 engine, which itself is a copy of the Opel X14XE engine. You can find this engine under a hood of several USDM Chevrolet models and European low budget cars such as Daewoo Nexia or Lanos. The engine has the same cylinder block design as the 1.4-liter F14D3, but with the bigger bore. The F16D3 has forged steel crankshaft. 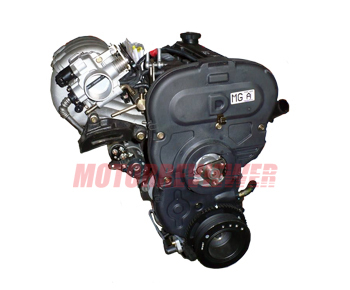 On top of the engine block, there is aluminum cylinder head with two camshafts (DOHC). The cylinder head has 16 valves (four valves per cylinder). The engine got hydraulic tappets and timing belt which is not reliable as a chain. The F16D3 also had with EGR system. The engine was improved in 2008 and got the new name - the F16D4. For those who want a more powerful engine, look at the1.8-liter F18D3 engine which has the power of 121 hp. Main disadvantages are the same as the engine F14D3 has. We have EGR which is not good as it could be, trouble with valves closing gap, overheating, leaking oil from the valve cover. Many owners prefer to forget about EGR and plug out the EGR valve. This operation helps to avoid any future issues.